To donate in memory of Soley, please click on the "Donate" button. We were over the moon to become parents on July 2nd, 2013. Our baby girl, Soley, had big blue eyes and a lot of determination. She was perfect in every way. But just three months later, our perfectly healthy baby started projectile vomiting. We brought her to the hospital, thinking she had the flu. Turns out we were very, very wrong; she actually had a brain tumor. Suddenly our sweet daughter was rushed to the OR for emergency surgery. I had never left her side before, especially since she was 100% breastfeed - but this night, we had to leave her alone in PICU. We felt our world collapsed but tried to hold on to hope. 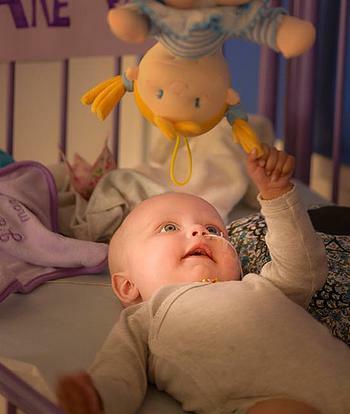 A few weeks later, we were told her cancer was ATRT, and that the prognosis for young babies like her was very bad. Despite this news, we were nowhere near ready to give up on our daughter, so we decided to treat her, hoping she would be our miracle. We spent six months at the hospital and she went though chemotherapy with a smile on her face. Her strength amazed everyone. Chemo didn't even made her sick! But unfortunately it wasn't efficient on the tumor either. Even though we tried everything, it kept growing and spreading. At the end of April, Soley's case was classified palliative. On May 19th, we had to put her in a coma to give her relief from the epilepsy caused by the tumor. And on June 8th, 2014, our baby died in our arms. She was only 11 months and 1 week. She did not lose her battle and she never stopped fighting. She did not die because she was too weak. She died because there is no effective cure for AT/RT. Our daughter was strong, but research was weak.